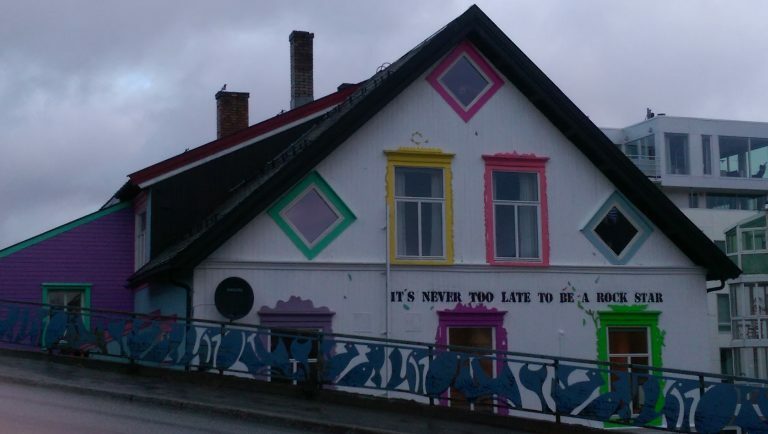 Everything about Tromsø is northern. The northernmost city in the world with a population over 50,000 (actually over 72,000). The northernmost botanical garden. The northernmost university city. The northernmost cathedral. It’s been inhabited since the last Ice Age, and used to be the boundary of the Norse kingdom, with the areas to the north home to the Sami people. The Sami community remains strong and signage is often bilingual. It was a frontier town on the former border with Russia, and although this was long before the modern town was built it still feels to me as if it has a frontier flavour. Many Arctic expeditions set off from here, including those of polar explorer Roald Amundsen. 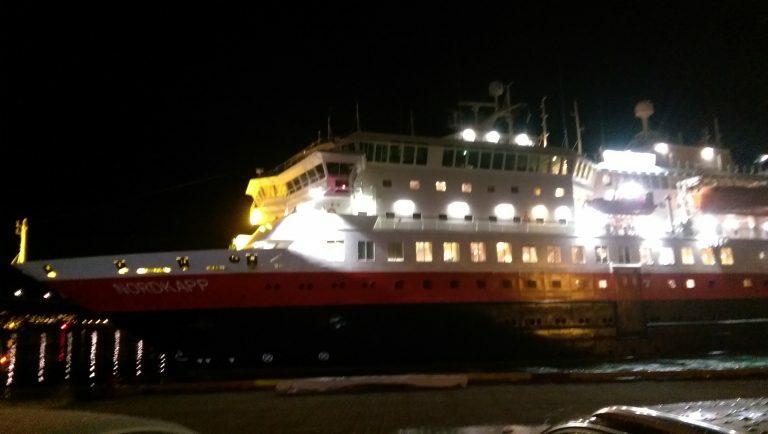 Tromsø is actually a series of islands connected by startlingly graceful bridges, with a working harbour – the Hurtigruten ferry, which runs the length of Norway’s intricate coastline, docks here. The bars and cafes are lively well into the night, and a lot of people come for the Northern Lights, which can be spectacular. Polar night begins on 21 November, and the sun doesn’t make it over the horizon again until 21 January, when its couple of minutes’ appearance is greeted with celebrations and saffron cakes. But Trine, my host and a member of the Sami community, loves the winter. She tells me of a Sami poem that speaks of the moonlight and the brightness of the snow, the Northern Lights and the colour of the ice, the variety of the landscapes and shadows that only come into sharp relief in the winter and make everything crisper, cleaner, more interesting and more exciting. It concludes, wonderingly, with the line: “And they call these the dark times”. 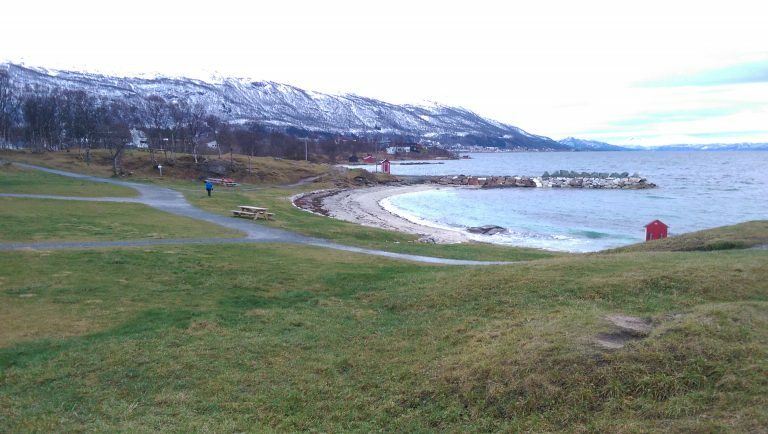 Unlike in Trondheim, autumn here is long gone. But many feel the best of the year is yet to come. I can’t because the lights around the airport are too bright, but it’s exciting to know it’s a possibility tonight. The air is crisp and cold, but no chillier than Glasgow on a January Saturday. Probably warmer, because it’s dry – though I imagine the temperature will drop later on as the sky is absolutely clear. I arrive at my apartment and Trine, my host, is every bit as excited on my behalf as Kari Anne. “Come on! I’ll take you up the hill.” We set off, but away from the main road it’s icy. That’s no problem for Trine, but with a knee that’s still a little fragile I decide to stay in the harbour and catch the view from there. 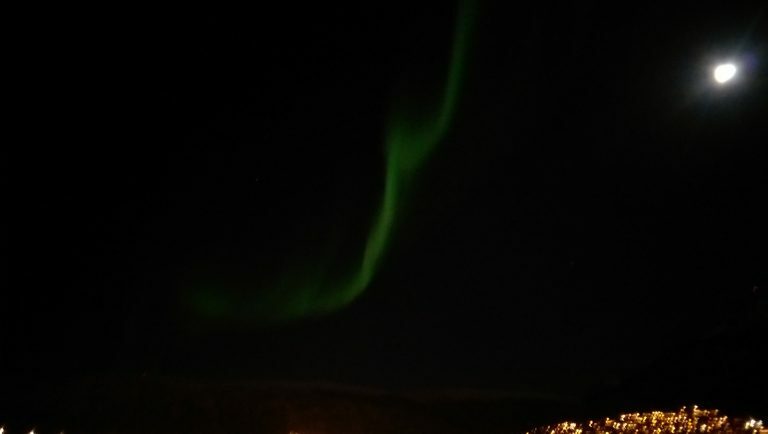 It may not be the most dramatic display Norway has ever seen, but it will do for me. A lifetime ambition achieved. And I’ve only just arrived. Today I’m at Statped, one of whose roles is to advise education professionals supporting young people with special needs. The office is up the hill from the centre, and I’m quickly into snow and ice. This has no impact on life whatsoever: people are walking, jogging, cycling, in conditions that might not bring Britain to a halt but would certainly deter the casual walker. It’s bright sunshine too, though, and the harbour – surrounded by islands – looks amazing. I’m slightly thrown by getting off the bus two stops early, and realising Tromsø doesn’t worry overmuch about street signs. But it’s a good opportunity to give some locals the chance to do their good deed for the day. 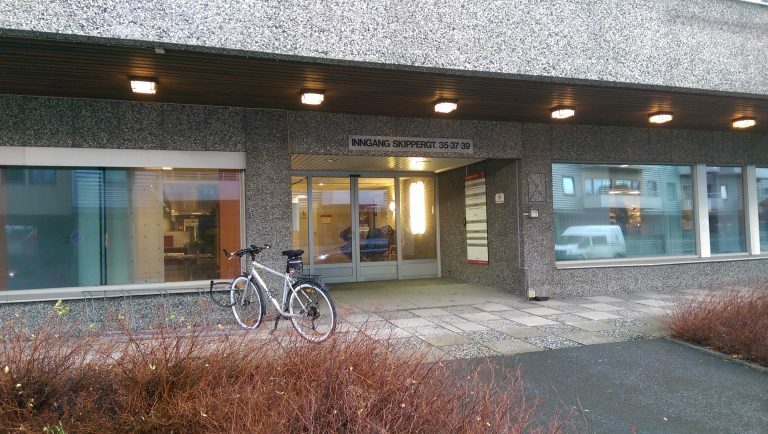 They’re really helpful, and I’m only 5 minutes late arriving at the Stadped office, and my meeting with Øyvind Jensen. 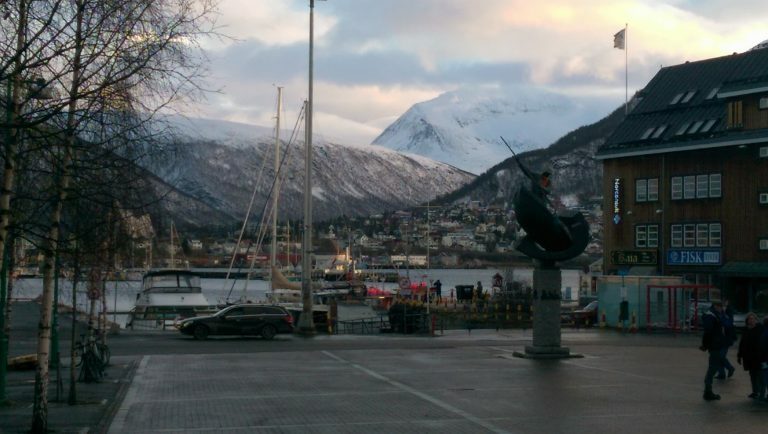 Tromsø is photogenic in the snow. I’m making the most of it, because rain and storms are forecast for the rest of my time here. Happy Halloween! But I can’t see much evidence of it here. A few large black spiders in the shop windows and that’s about it. This afternoon I meet Kari Anne, an adviser on special needs and a key member of the social care team here. We share a passion for improving services for people with all kinds of special needs, and particularly autism and Asperger’s syndrome. Kari Anne takes me for a drive to a nearby beach – it’s beautiful, but the wind is getting up and dark clouds are rolling in. The very thought of skinny dipping makes my flesh shrink (though people do, all year round), so we head instead for Polaria, an education and information centre, and a really good introduction to the polar wilds. Later, I go looking for some ghouls to photograph, but the town centre’s deserted. To be fair, it IS pouring, and I’d guess any self respecting monsters will be at home with their feet up in front of a blazing fire. A stormy day today with high winds, but it doesn’t put us off. I meet Kari Anne and her partner Lars, and we go over the beautiful, distinctive bridge linking Tromsø to the mainland. The whales have arrived in the fjord very recently – hump backs and killer whales, following the herring shoals that end up in the north of Norway at this time of year. Usually they stay around for a month or so before heading back south. There are whale safaris, but no guarantees of seeing anything, and today’s a bit unpredictably stormy to be out in a boat. Low cloud means the full splendour of the landscape is muted, but it’s still pretty amazing – jagged peaks (one so resembles a sharpened fang it’s known as the Devil’s Tooth) and steep slopes into the water. It’s like the far north of Scotland, but more so. 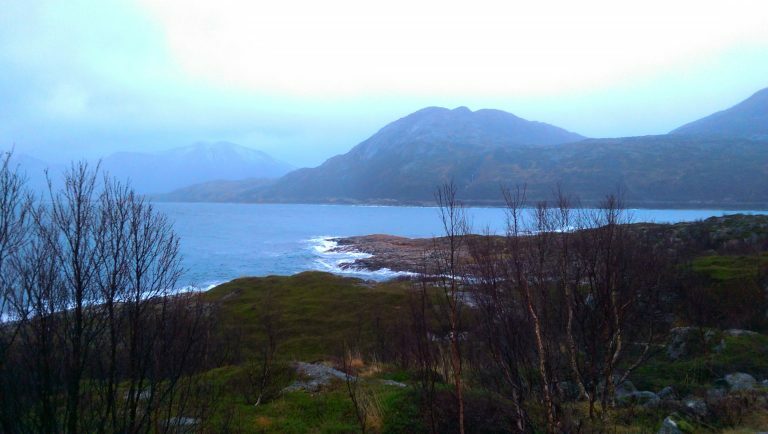 On the island of Sommerøy, we get out of the car: this is as far as we can go by road. 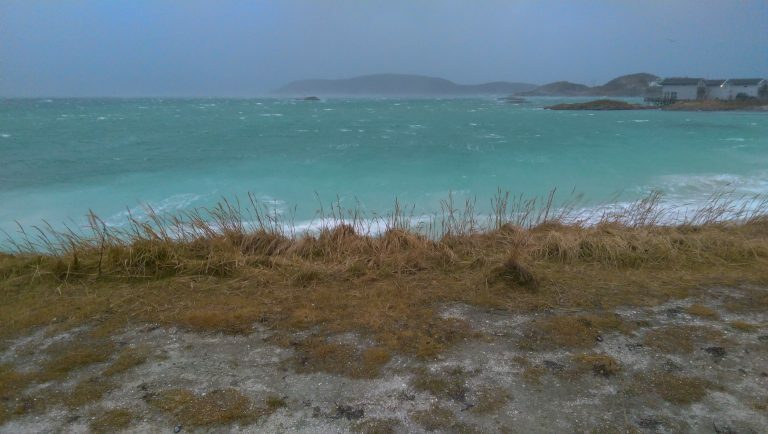 The colour of the water is an incredibly beautiful light blue, and the wind almost literally knocks me off my feet. This could blow you away, no question. Not too far off waves are breaking on the rocks and sending spray 10 or 20 feet in the air. If the weather was better we’d walk, but instead coffee seems like a good idea. In Norway, like Italy, there’s no time coffee doesn’t seem like a good idea. The hotel bar is warm and welcoming, a bit like the Fuaran north of Achiltibuie. I gather it’s in demand in the summer as a wedding venue. It starts getting dark now about half past two, so we decide to head back to Tromsø. We’re driving along the Kattfjorden when suddenly Kari Anne says “Whales! Back there!” Lars swings the car round and pulls over. We run down to the small beach and there they are – a group of killer whales, about five or six of them, surprisingly close to the shore and making their way towards the open sea. It’s an amazing sight – huge creatures gliding smoothly through the choppy water, going about their business without any sense of the excitement they’re causing for the irrelevant creatures skipping about on the sand. I hear later someone spent 5 hours looking for whales at the weekend and didn’t see any. Kari Anne’s a lucky charm. In the evening I eat with Lars and Kari Anne in their apartment above the town. On a rain-lashed pitch, Tromsø thrash nearest neighbours Bodø (only 550 km away so a derby, really) 3-1 and avoid relegation this season. Back to work, and today I’m meeting parents and board members of the Norwegian Autism Association. Katrine Eielsen and Bente Høiseth have been my contacts for this, and it’s great to meet them face to face. The Association offers telephone support and is an information hub for all parents of someone with autism, no matter what their age, although in practice many of the most active members have school age children. They also organise outings and activities, giving young people the chance to meet others with similar issues, build relationships, and access new experiences without their parents. We talk about individualised plans, and the challenges of making these work: great in theory, but unless there is clear coordination, agreed lines of responsibility and sufficient awareness on the part of professionals, we agree all too often they are doomed to be worth no more than the paper they’re written on. One unexpected bonus is the presence of Tone, the mother of a 20-year-old son who has recently attended one of Norway’s folkehøgskole or folk high schools – these give any young person the chance to spend a year away from home, following a range of interests and learning new skills. No qualifications or previous experience are needed, and although they aren’t specifically for people with special needs they can be an ideal “next step” for school leavers who are highly functioning. I arrange to meet him to find out more about his experiences since leaving school. This morning I’m in the office of Heidi Matre, leader of the coordination team within Tromsø municipality. I like her immediately. She’s brisk, doesn’t beat about the bush, and is 100% committed to achieving the best possible outcomes for the young people and adults she works with. There are many things I admire about Heidi in the relatively short time we spend together, but above all is her deep understanding of the highly individual nature of the challenges faced by people with learning difficulties – particularly autism and Asperger’s. For some people, all it takes is a 5 minute phone call: for others, meetings at home or elsewhere. Only tailored support, she says, is really effective: “one size fits all” isn’t just not beneficial, it can be counterproductive. Heidi has been part of some people’s lives for a number of years now, and continuity is one of the key components in the support she and her team give. I have the impression Heidi would take no prisoners, and this is confirmed later by someone who has seen her in action. A large part of her team’s role is to make sure others carry out their responsibilities, and if I was looking to get things moving I’d be happy to have her on my team. 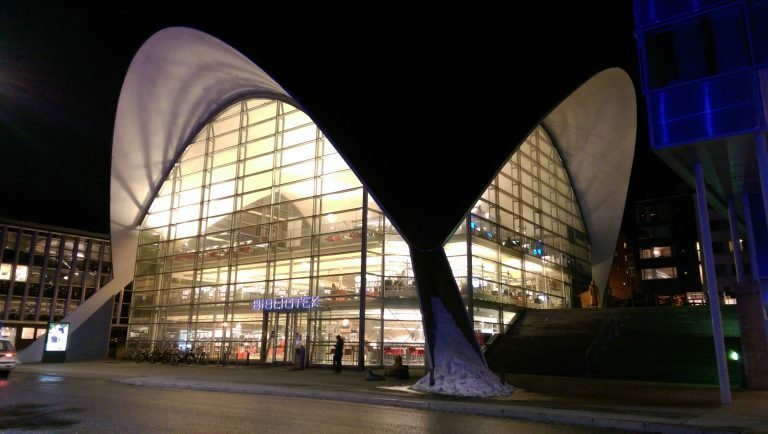 The Tromsø municipality is piloting a new system, developed in Denmark, using IT to link services and service users in an effective, flexible way that saves time and energy. Heidi shows me the system and I’m quickly hooked. There is so much about this that makes sense. Again it strikes me the biggest blocks to progress are not the conditions the people we’re supporting are living with, but the structures and systems we create. But the good news is, what we set in place, we can also change – there’s nothing that says things have to be fragmented, inefficient and useless. It makes me wonder what we’re waiting for. In the afternoon I meet Tonje Hansen, a psychologist specialising in assessments and diagnosis of autism and Aspergers in people who are over 18. And in the evening, I have a long and interesting conversation with Tone’s son, who speaks eloquently and sometimes with painful clarity about what having Asperger’s is like for him. 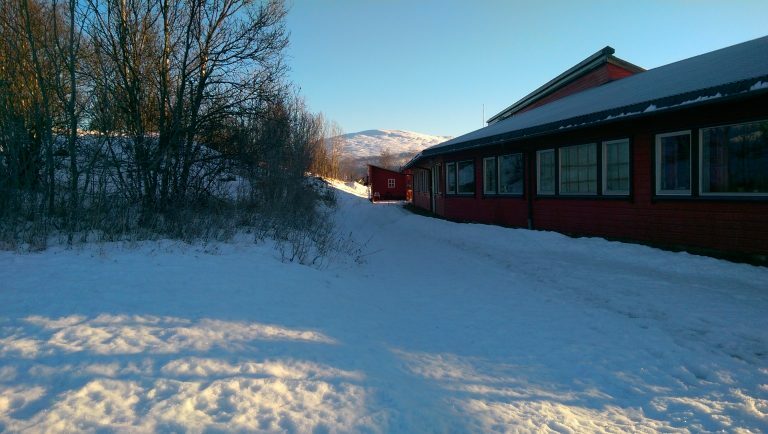 This morning I called the national governing body for the folkehøgskole in Oslo – I’m now interviewing one of the directors next week and plan to find out a lot more. 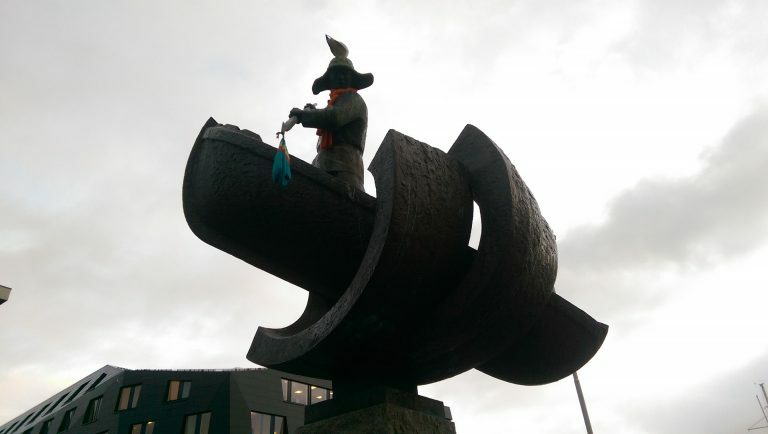 So it’s goodbye Tromsø. Travelling like this is fantastic, but it always leaves you wanting more. 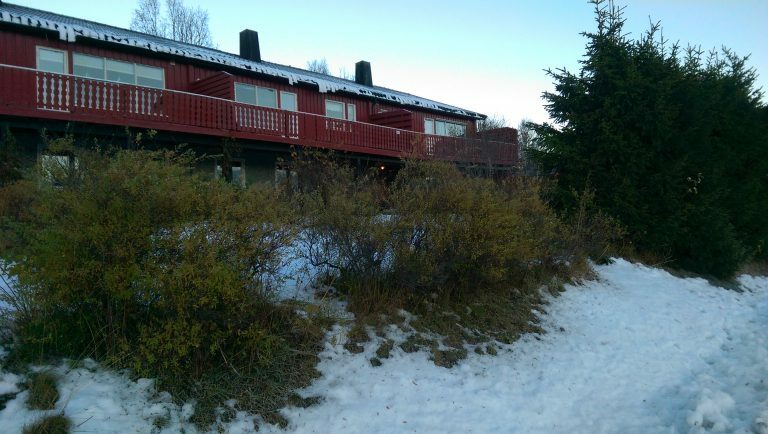 I’ve learned in the last 24 hours of three more people I’d love to speak to: one is an expert in the Sami community, which I have discovered is far more separate and distinctive than I initially thought – to the point that people I’ve met feel so unqualified to speak of it they simply shake their heads when I ask. Trine, my host, is Sami, but her background isn’t health, and although she points me in the right direction she isn’t the person to answer my questions. So with the help of Professor Siv Kvermos (who turns out to be on sabbatical in Melbourne – it really is a small world these days) I’ll be following this up from home.